Published August 11, 2014 By Anna T. This post may contain affiliate links. Regardless, I only recommend sites I've researched and/or used and trust. One of my readers mentioned iTalki in a comment the other day. 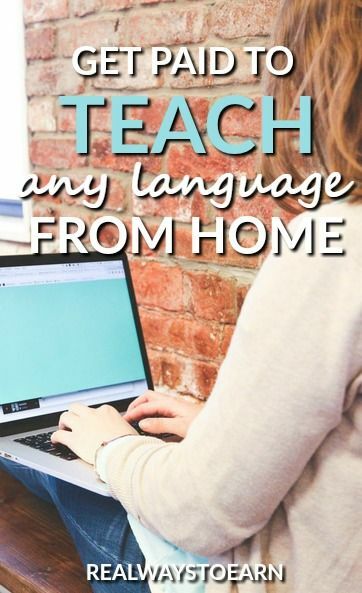 I had seen this site mentioned before as an option for teaching languages at home, so I decided to check it out. A little bit of browsing confirmed for me that this company is extremely reputable and also offers a decent opportunity for anyone to earn money online. If you know any language, including English, you can potentially make money on iTalki. Also, iTalki is open worldwide! I get a lot of requests from people looking for companies that are open outside the US, so I was glad to see this one definitely fits the bill for that. iTalki is a global community of over a million language learners and more than a thousand language teachers who are studying over a hundred languages. The company is officially registered in Hong Kong and was founded in 2007 by American and Chinese investors. iTalki has an impressive social media presence with more than 250,000 Facebook followers. After you sign up as a language teacher on iTalki, you'll be listed in their large database of teachers. If a potential student finds you in the listings, they will make contact through iTalki to book a teaching session. Sessions are conducted via either Skype or free VOIP software and can be as short as 30 minutes in length. When the session is completed, you'll receive the iTalki credits into your account and you and the student will both be prompted to leave feedback for each other. You will need to create a teacher profile once you're approved and in their system, and it's important to make it good because potential students will “window shop” looking for an ideal language teacher. I read online that some teachers make introduction videos to place on their teacher profiles to show that they do natively speak the language they are teaching. This page on the iTalki website does an excellent job of explaining exactly how a typical tutoring session works. iTalki operates off of a credits system. Ten iTalki credits is the same as one US dollar. You are allowed to set your own rates for sessions. If you're unclear what you should charge, you may want to browse other teacher profiles to see what other teachers are charging. iTalki takes a 15 percent cut of your earnings. You are allowed to withdraw your iTalki credits for cash twice per month via Paypal and/or Skrill. This is pretty much on your schedule because you can set up your available teaching times for potential students. Also, iTalki has something they call “instant tutoring” where you can just log in anytime and take sessions if you get any. So it is very flexible. You don't have to meet any super specific criteria to qualify as a community tutor for iTalki. You basically just need to have a native fluency in the language you're planning to teach. Professional Teachers at iTalki do have to prove they are professionals. You will qualify as a Professional Teacher if you have either a university or higher degree in education, language teaching certificate, teaching license, or proof of employment at a language training or teaching institution. Documents proving these credentials will have to be scanned and uploaded to iTalki for proof. All you need is a computer and a headset. I'm not finding anything particularly negative. I usually head to WAHM or or other forums to find some good first-hand accounts of experiences at different companies, but those turned up empty for iTalki. To sum up, the company has good reviews from workers overall. People enjoy meeting the students and being able to set their own schedules. On the flip side, people do not like the fact they have to market themselves to attract students. I also saw some complaints that it's difficult to make more than minimum wage when you are just starting out on the site. Are you interested? If so, go here to apply as a tutor or teacher. If you're curious, I have a list of many other companies that pay you to teach English online. Also, FlexJobs is a fantastic resource for finding current work at home job leads. I've been a paying member for over a year now. They have daily job postings for work at home positions in the ESL field as well as in other categories. Good information here on iTalki. I just got approved as a professional English teacher on iTalki. The platform is very well thought out, organized and has features to ask simple questions of the community about languages. There are articles written on language by the community of teachers. The atmosphere seems friendly and much more of a community than many other language learning sites. I look forward to teaching English, specifically business English on iTalki. This a great article on ITalki and fantastic blog from Austin Wood. I love this blog. Thank you so much Cikgu (Malay) Anna. Hi Anna! Thanks for the great review. You’re pretty spot on about teaching on italki. A great resource for aspiring teachers is our Teacher Resource site teachers.italki,com. We welcome native speakers of all languages to come and teach! One small correction… As of August, we just started paying teachers twice a month now (at least using Paypal and SKRILL).